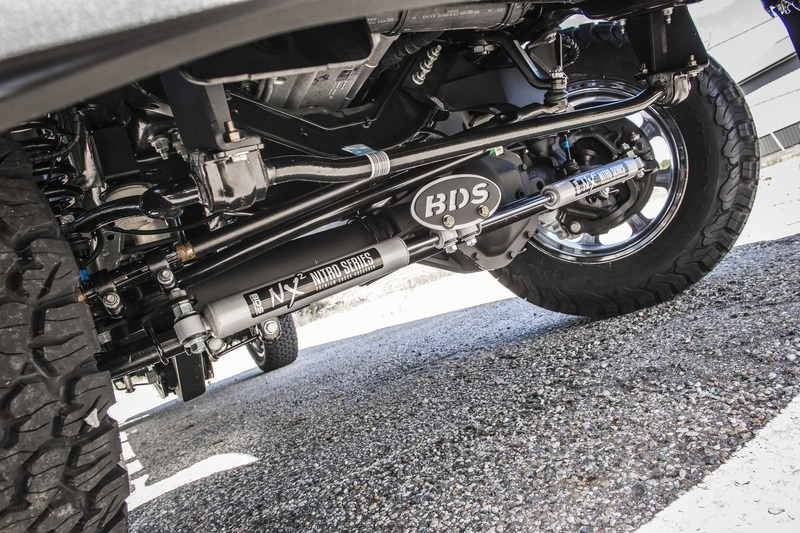 BDS Suspension expands its lineup of suspension lift kit offerings for the redesigned 2017 Ford F250 and F350 Super Duty 4wd trucks with new 4" radius arm lift kits for both diesel and gas engine equipped trucks. Designed to improve offroad performance and tire size fitment, these new 4" lift options maintaining on road ride quality, handling, and comfort with room for 37" tires. As with all BDS lift kits, these 4" lift kits are backed by Factory Protection Plus for peace of mind wherever your adventures may take you. Factory Protection Plus includes BDS’s exclusive No Fine Print Warranty along with a 5-year, 60,000-mile drivetrain warranty. Get the lift and the look you are after with this new 4" lift kit from BDS Suspension. BDS 4" Radius Arm Lift Kits: 2017 ushers in a new era for the Ford Super Duty with a re-engineered platform, fully boxed frame, aluminum alloy body, retooled styling and tons of new technology. Along with these updates Ford made some updates to the suspension to improve durability and function while retaining a similar coil sprung radius arm front with leaf springs in the rear. 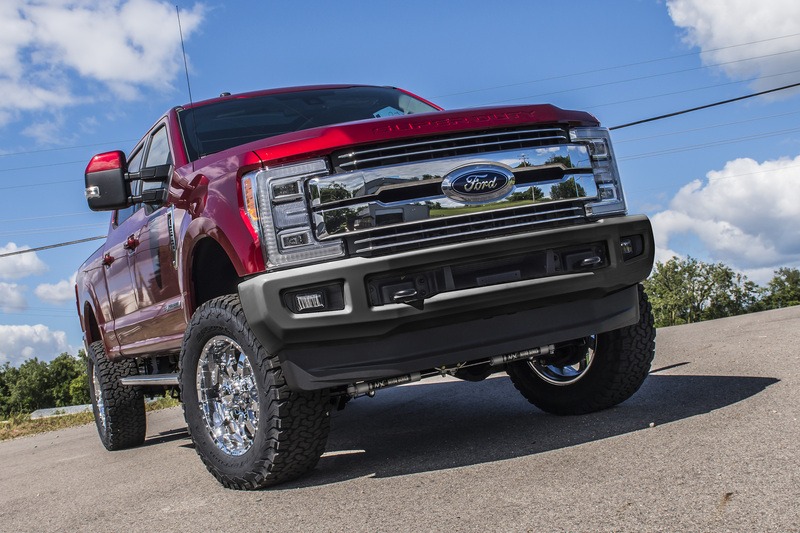 With these updates the engineers at BDS Suspension set out to develop a full lineup of suspension lifts to improve the new Super Duty's performance, comfort and capability. The newest kit to hit the shelves ready for sale are new 4" radius arm systems offering clearance for 37" tires while improving ground clearance, articulation and overall performance. At the heart of these systems are a pair of heavy duty radius arms built to withstand whatever abuse you can throw at them. Built from 1-3/4" OD -10GA DOM tubing with support gussets, these replacement arms are far superior to the factory stamped steel units. They use a high clearance design for extra ground clearance and are formed inward to allow for additional clearance of oversized tires. They incorporate factory style 3-1/4" rubber bushings to minimize road vibrations and allow for a long, maintenance-free bushing life. The arms bolt into the factory mounting points and reposition the front axle to correct caster angle. The additional 4" of lift comes from a pair of full length ProRide coil springs. These springs are available for diesel or gas engine specific spring rates for optimal performance and a true 4" of lift. These paired with your choice of BDS NX2 series gas shocks or the precision tuned FOX 2.0 performance gas shocks offer a smooth ride and improved control over rough terrain. To improve steering angles a forged drop pitman arm is supplied with an integrated drag link flip. Used in combination with the 1/4" thick heavy duty track bar drop bracket will position the front axle and keep the track bar angle in phase with the steering for improved handling. Also included for the front suspension are a pair of sway bar relocation brackets, bump stop extensions, brake line relocation brackets and a NX2 series steering stabilizer with mounting bracket. Out back a 5" fabricated block with integrated bump stop wing is used in place of the factory block on the F250 or F250 to level the stance. 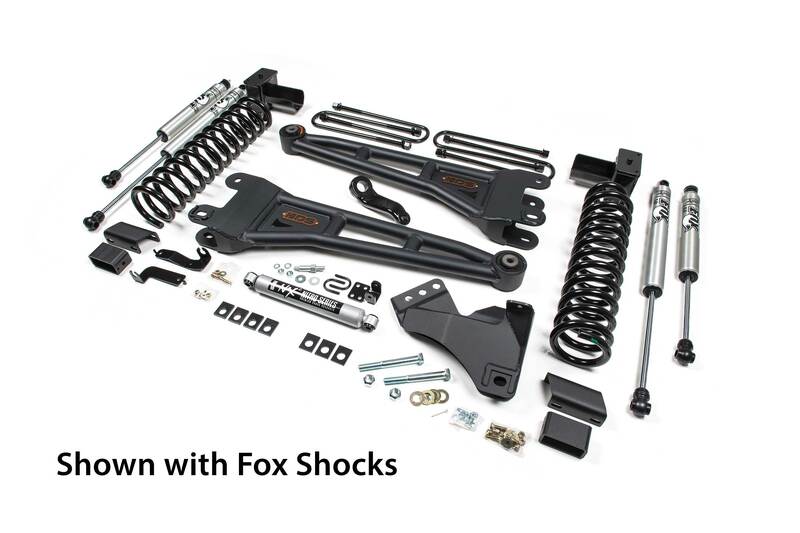 Longer black e-coated u-bolts and your choice of NX2 or FOX 2.0 shocks round out this 4" radius arm lift kit. 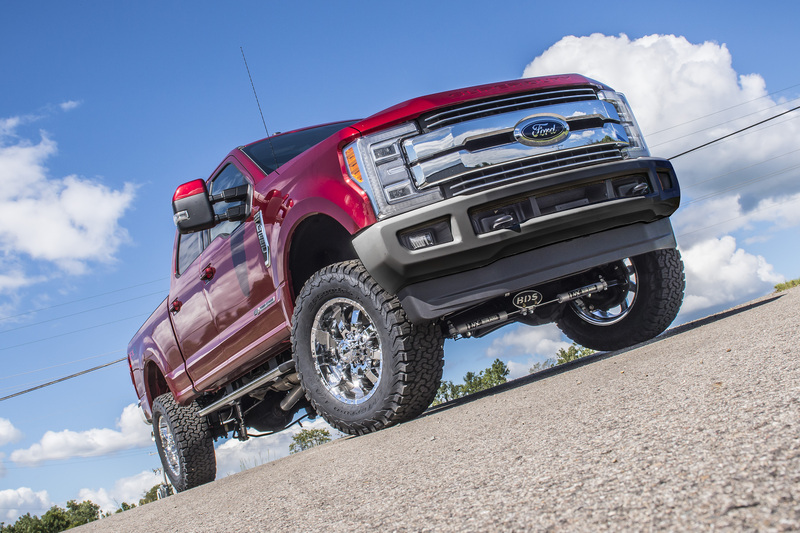 Take your new 2017 Super Duty to the next level with BDS Suspension. Just got through installing your 4″lift on my 2017 . Long story short ,leave the stock blocks in the rear . The blocks that you include in the kit are to much. Personally, when I lift a truck I want the front a little higher than the rear. If you use the blocks the truck stink bugs bad. I realize that when you have a heavy load that the stink bug would be nice,but most people buy the lift for everyday looks. If you need to carry an load fill the air bags,youll need them anyway. Thanks for the feedback Dave, reusing the stock block in the rear is an option to achieve the look you are after. We design out kits for a level stance front to rear. Both the F250 and F350 use the same front suspension, the rear on the F250 uses a stock 2.5″ block where the F350 use a 3.875″ block. Our 4″ radius arm kit uses a replacement 5″ rear block designed to level the stance regardless of how the truck sits from the factory. I would like to know if anyone can tell me if 35″s on the stock rims will rub the radius arms at full lock. I do not know what the offset is on the stock rims and cannot seem to find anyone who knows. On my 14′ I had a Readylift leveling kit. They told me 35″s would work without rubbing and they were wrong. After spending $2k on tires I lived with it, but I’m not going down that road again. I would very much like to know with 100% certainty before buying the kit as I do wish to maintain the stock wheels if possible. Our 4″ kit includes replacement radius arms that a formed inward to allow for additional tire clearance over the stock radius arms. That said we haven’t tested the kit with 35×12.50 tires on stock wheels so we wouldn’t be able to offer a guarantee they won’t rub the radius arms at full turn, they will definitely clear the fenders though. The factory wheels used different diameters, widths, and backspacing measurements for the 17″, 18″ and 20″ wheels. Our 4″ kit allows for up to 37×12.50 tires, however that is with an aftermarket wheel that is 9″ wide with 4.5-5″ backspacing. Other sizes can be used, however we can’t guarantee fitment without trimming/modification being required. Hey Justin, the 2WD and 4WD Super Duty use a different suspension design, this kit will only work on 4WD models. Hi there Alexandre, I’m sorry to hear you’re experiencing driveline vibrations with the 4″ kit installed. Our tech support team is available to help get to the bottom of it to resolve the issue, you can reach them at (517) 279-2135 or tech-bds@sporttruckusainc.com. You can also stop by your local BDS distributor for assistance. Hi, I was wondering if you could tell me what brand and model wheels are on the truck in the gallery for this lift. They look great! Does anyone know of BDS will be coming out with a 6 inch lift for the 2017 F250 line?? I’m currently torn between doing a 4 or 6 inch lift. But would prefer to purchase a BDS product. Thanks! You guys don’t happen to have any diagrams of how this needs to be done? I am having this lift professionally installed at a shop so I can’t imagine this extra work being too difficult. I am purchasing this lift for my 2017 F350 SD 4×4 super cab. Will I be OK on 20×10 – 4.5 backspace wheels?? Hey Gregory, thanks for reaching out. You’ll be fine to use that setup on your 2017 Super Duty. The 4″ radius arm kit comfortably fits a 35×12.50 tire on 20×10 (4.5″ BS) wheels. Hi Carter thanks for answering my above question. F350 Chasis/ cab truck upfitted with a 9′ Bed?? The front suspension appears to be the same from what I can see. Hey Gregory, these systems are designed to work on all 2017 F250/F350 models. Be sure to verify if the rear suspension has the OE 2-main leaf setup or 3-main leaf setup to order the correct rear lift to fit your truck (more info on our website under the kit customizer tool for the 4″ radius arm systems). Just curious what size tires are pictured? My question to you do you have a leveling kit and a 4 inch lift kit for a 2017 F450 dually . Hey Joel, thanks for reaching out. At this time we don’t list systems for the 2017 F450 as we haven’t had a truck in the R&D shop for fitment. That said we have heard the F250/F350 leveling kits will install on there without issue. any news on a lift for a F450? if the level fit in the front, is there any option for the back? At this point we haven’t tested compatibility on the F450 to officially add those listings. That said I have heard of dealers running our F250/F350 leveling kits on the F450 without issue, it’s just not something we’ve confirmed at this point. Is this still the case? Nothing for the new F450 yet? Unfortunately no late model F450 kits at this point. Hey CJ, thanks for reaching out. No issues adding the 1″ coil spacers onto that kit. Several of the components cross over between the 4″ and 6″ lifts so they can accommodate the extra 1″ boost. The bolt-in lower coil spacers are solid 6061 aluminum, more than strong enough to hold up to the weight and use on either gas or diesel trucks. Are the sway bar drop brackets in picture above supposed to be 2″ or 4″? the sway bar relocation brackets in the 4″ lift kits are not the full 4″ tall, they will be closer to 2-3″ and are offset to relocated the sway bar down to correct the positioning. Hi Carter, thanks for the reply. So i’m guessing on the 6″ lift kits the drop would be the 4″, is this correct? Hey Carter, would you happen to know what the part number is for those sway bar drop brackets? I have the 4″ BDS radius arm lift kit and it came with 4.5″ drop brackets. The sway bar is hanging really low and doesn’t look right at all. What offset rim would I need to clear 37″ with 12.5 width truck is on rough terrain regularly. Looking to install your 4″ lift on 2017 f250 platinum that has adaptive steering and the 7 camera option. Will I lose my adaptive options or will they not work correctly? Also the 7 cameras installed id hate to install lift and cameras not find my trailers barcode sticker designators. I don’t know if the cameras are adjustable. The tow package is pretty specific on entering distance data. Can you tell me if you have a lift package specially designed for 2017 platinum f250 witch has all the factory options? Hey Tim, thanks for your interest in BDS and for reaching out to us on kits to fit for Super Duty. Our lift systems are designed to work on all 2017 F250/F350 4WD models, regardless of trim package. I touched base with our tech support team on this one and while the topic has come up, ultimately our kits can and have been installed on the 2017 Super Duty Platinum trucks optioned out with the adaptive steering and adaptive cruise control systems. hThat said some trucks required additional mods following the kit installation. On some trucks recalibration of the systems is needed once the truck is aligned to resolve warning lights if they appear on the dash. Due to the design of our kits, the front is lifted 4″ and the rear about 2″ to level the stance. The adaptive cruise control sensor located behind the front bumper may need to be adjusted for proper operation. As far as the 360 cameras I don’t believe they are adjustable, the truck will be sitting roughly 5″ taller in front (4″ lift + 1″ tire radius difference from stock to 35s) and 3″ taller in the rear (2″ lift + 1″ tire radius difference). I can’t say if this will cause issues with your truck’s camera system and trailers. We also offer other rear lift options to achieve your designed stance. Ultimately our kits are designed to lift the trucks for fitting larger tires while improving their offroad capability and maintaining the on road comfort. For more on the topic contact the BDS tech support team at (517) 279-2135. Im Wondering if your 4in kit will fit on a 2017 f350 dually and If not do you have a kit that will fit a dually no bigger than 4in. Hello Tomio, our suspension systems are designed to work on the F250, F350, and F350 Dually trucks. What size rims/tires would be recomended? Hey Bill, we have the recommended wheel and tire specs listed above in the chart, this kit allow for fitment of up to 37″ tires. I’m looking to install your 4 inch system on my 2017 F350, will I be able to run my factory 20 inch wheels with the factory rubber. 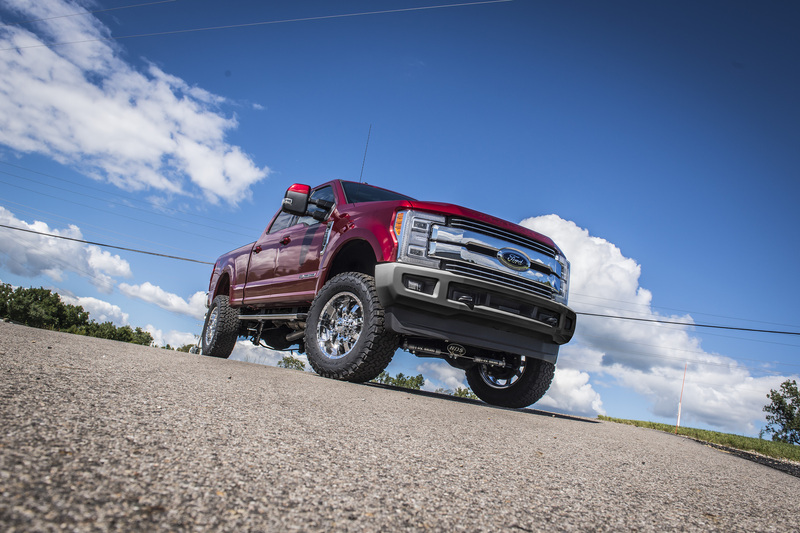 No issues running the stock wheels/tires on your 2017 Super Duty with our 4″ lift installed. The setup will seem a bit small on their as the lift will allow clearance for up to 37″ tires. Hey Carter, I am looking to install your 6″ C/O LA system on my 2017 F-250. I am looking at a 37×13.50R22 Toyo M/T on 22X10.5 wheels with 4.75 backspacing… In your opinion would this be okay to run with no rub or trimming? I can see the system can clear 38’s Im more concerned about the width… Thanks! So the red truck pictures has 35×12.5 tires right? What are the specs on the wheels on that truck? Hey Jared, the red Super Duty shown is outfitted with the BDS 4″ radius arm system, the tires are 35×12.50×20 BFG KO2s and the wheels (I believe) are 20×9 Ultra wheels with 5″ backspacing. The wheels were customer supplied so I’m not sure on the wheel model of this particular truck. Thank you Carter. Picking my super duty up tomorrow from the dealer and it’s the same color. Love the look of that truck pictured. Thanks for the info! Will your 4″ radius kit keep the factory geometry specs? Hey Gary, anytime the ride height is modified there are some changes to the factory geometry. Our 4″ radius arm systems are designed to correct the suspension, steering and driveline angles to maintain handling/drivability while improving capability and tire clearance. With the 4″ kits our replacement radius arms mount into the factory mounts but are designed to correct the front end caster one lifted. Similarly our drop pitman arm corrects the steering angle and works in combination with the track bar drop bracket to keep the steering in phase with the track bar to eliminate the potential for bump steer. When realigning the truck after the lift installed the truck will be set to factory alignment specs. Eyeballing the 4 inch lift for 18′ f250. Wanting to run 37×12.5 on 22×12. What trimming will need to be done? Hi Mark, thanks for your interest in BDS Suspension. While it can be done, that lift-wheel-tire combo is outside of our official recommendation and will require trimming. As far as how much trimming I don’t have an answer there other than to say that even with 37×12.50 tires on 10″ wide wheels (5″ backspacing) some trimming is needed to clear the fenders in all driving situations on/offroad. My recommendation would be to go with the 6″ lift for additional tire/wheel clearance or be prepared for a fair amount of trimming to clear with 4″of lift. So I’m getting this kit installed in 2 weeks but I’m having a hard time deciding between the fox 2.0 upgrade or standard nx2 nitro shock… I have the budget for the fox for both duel stabilizer bar and all around the truck. Regardless the place I’m getting the lift says the nx2 rides better then the fox meaning the fox is stiffer on bumps and the nx2 rides smother. I won’t be doing any kind of offrroard but I do like to have it stable around turns as I go up and down a mountains everyday and turns. So once again the $500 extra dollars is not the concern it’s the shock performance… Am I just paying for the name and what is the performance difference if not using off-road between the two? 1. What is the rake of the truck with the 5″ rear block. It seems to me (although you all state a “level stance”) that the rear is still slightly higher than the front (this was confirmed by stage 3 motorsports in their review of the 4″ RA). I do not have the snow plow package. I am looking for the truck to be perfectly level while unloaded. If there is still some rake with your kit, can anything be done on the back end to correct this for me? 2. I will only have this truck in light off road situations (“mostly” cleared level off-road) and will be my daily driver for the most part. I would consider doing the 4″ C/O for its increased comfort in normal driving conditions. Do you have any thoughts here? Will the ride quality either on or off road be noticeably better? I have never used a C/O lift before. 4. I have done no research on this question, but can airlift air bag systems be used with any/all of the 4″ kits from BDS? Apologies for so many questions, and thank you in advance for your help. 1) From the factory the Super Duty sits about 1.5-2″ nose low. These trucks come with a factory installed 2.5″ rear block and ride height will vary slightly as some come with 2-leaf or 3-leaf main leaf spring packs plus the factory bottom overload leaf. Rather than stack lift blocks to net the lift we swap out the factory block for a 5″ tapered rear block to net 2.5″ of rear lift and level the stance with 4″ of lift up front. 2) Both options offer great on-road and offroad performance. The coilovers will have a bit firmer ride quality, but still comfortable and offer impressive handling. The true benefit of the coilovers is for high-speed offroad use there the larger FOX 2.5 cylinder of the specially tuned coilovers will offer superior damping performance. If you’re primarily on road you’re paying for the look of the coilovers, but not fully taking advantage of their capability. For some that’s justifiable, others choose to go with the standard coil spring setup with FOX 2.0 shocks. If you start with the standard kit you can always upgrade to the coilovers down the road, we offer the C/O upgrade kits separately if you decide to go that route. 3) These new Super Duty trucks are fairly bulletproof and our kits come complete with everything necessary to properly lift them. Steering, suspension, and driveline geometry is addressed for proper function. Outside of the standard components an upgraded steering stabilizer is a common upgrade. The kit include an OE replacement (single) stabilizer with a larger cylinder, but depending on road conditions and the tires you go with the dual stabilizer setup with help control the larger mass of the aftermarket tires better. Another optional upgrade would be the HD adjustable track bar. While the factory unit is adequate, our replacement unit is stronger and has an adjustable design that will work on a range of lift heights. 4) Being our 4″ kit retains the factory rear leaf springs the mounting points for the AirLift airbag systems will install without any special modifications. We run AirLift bags on mot of our tow rigs. I’ve looked all over and cant find a complete kit. I’m wanting the 4″ radius arm kit and the dual steering stabilizer kit together. 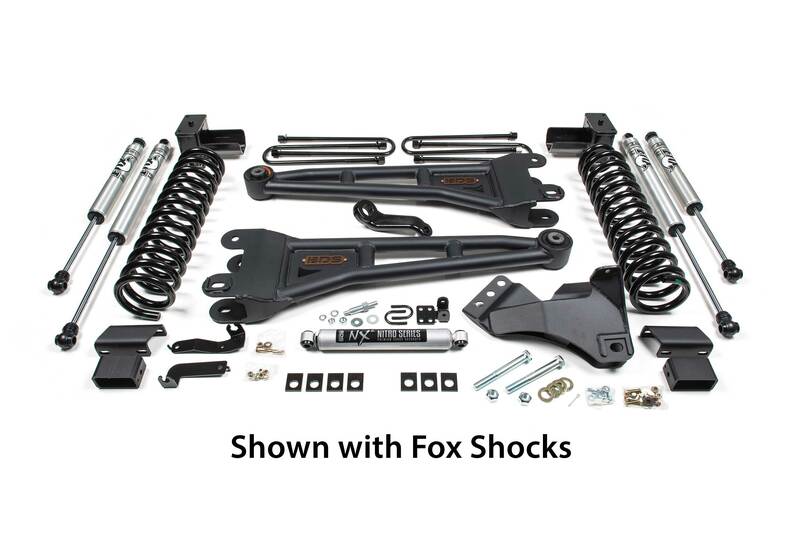 Is there a kit number for that with the fox shocks? Also does the bds kit change the caster to help eliminate the death wobble? we offer everything you need to set your Super Duty up right. We don’t package steering stabilizers in with the rest of the suspension system being we offer a few different stabilizer options, by listing them as an accessory gives customers the option to purchase separately. That said you can customize the kit to include them in there. 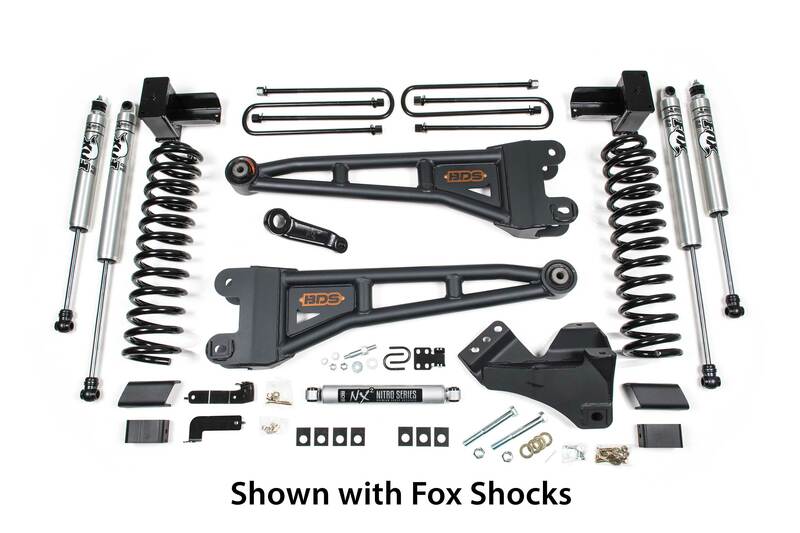 You can customize a 4″ radius system to include the FOX 2.0 shocks and dual FOX steering stabilizers right on our website at http://bds-suspension.com/kit-customizer?kid=1520H. Once you get through the selecting the option you can add the package to the cart to see all the individual box kit part numbers. Just had this kit professionally installed on my 2017 F250. The caster is out of spec- 7.2 on the drivers side and 7.4 on the passenger side. Toe and camber are good. Truck pulls to the right. Rotated the tires to see if that would help – no change. Any thoughts? I specifically purchased the radius arm kit because of the advertised camber correction. we’re here to help looking into the issue you’re having and help get it resolved, that said I’m not the best to offer diagnostic or tech support form the marketing department on the company blog. In chatting with tech support they mentioned a few possible ideas, but recommended contacting them directly or having your local BDS dealer take a look for assistance.